Zucchini noodles, aka zoodles, have been making their way around the food sphere for a while now and I finally jumped on the band wagon and tried them out and I was pleasantly surprised that they make an excellent substitute for noodles, rice, etc. Not only are zucchini noodles lighter and healthier but but they hold up like real noodles and they are a great way to sneak in some extra vegetables into your meals! 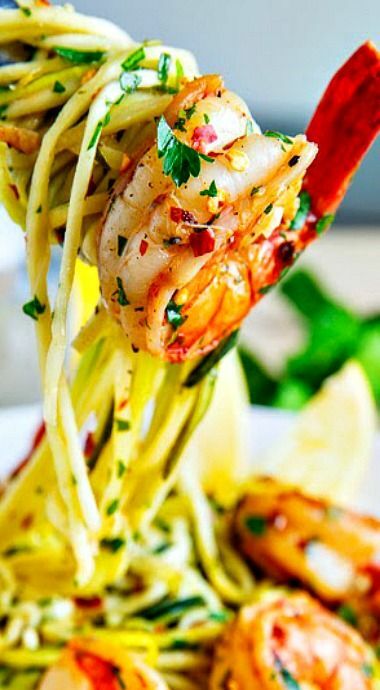 One of the first dishes that I thought to use zoodles in was one of my favourite pasta dishes, shrimp scampi, a dish where shrimp is served on pasta in a lemony, garlicky and buttery sauce. If you are into the lemon, butter and garlic combo (and who isn't???) then this dish is for you and it's so quick and easy to make, taking less than 20 minutes in total! The zucchini version of shrimp scampi is so much lighter and fresher than the pasta version and I think that I may just like it even more than the original! Shrimp served in a lemony, garlicky and buttery sauce over a bed of light and fresh zucchini noodles, aka zoodles; a lighter take on shrimp scampi. Heat the oil and melt the butter in a pan over medium-high heat until frothing, add the shrimp, cook for 2 minutes, flip, add the garlic and red pepper flakes and cook for 1 more minute before setting the shrimp aside. 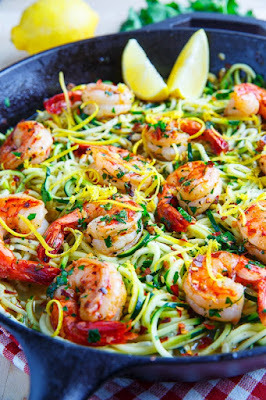 Add the white wine and lemon juice to the pan, deglaze it, simmer for 2 minutes, add the zucchini noodles and cook until just tender, about 2 minutes, before seasoning with salt and pepper, adding the shrimp, lemon zest and parsley, tossing everything and removing from the heat. 0 Response to "Shrimp Scampi with Zucchini Noodles"